Night Lights & Mood Lights--The touch control lamp is designed with 3 mode lights:warm yellow light (adjustable brightness:dim, low, middle and high) ;Red light and romantic color changing mood lights. 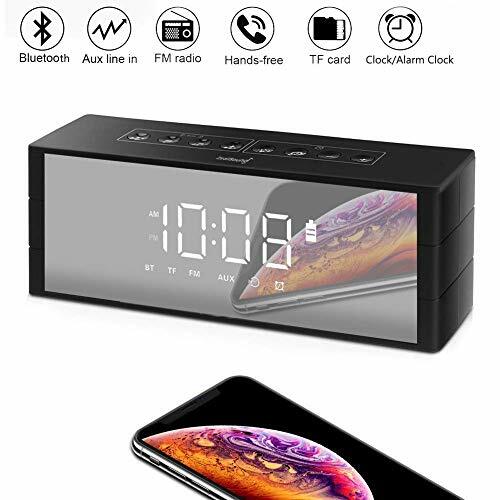 There are loads of portable Bluetooth travel speakers available, this particular model is an interesting two in one, not only does it play your tunes, it is also an alarm clock. Due to the twin use this looks very different to other low cost Bluetooth speakers tested, it features a single speaker set at an angle with touch controls for volume, call answering and clock adjustments located under the speaker. The power button, aux in and USB charging port are hidden around the back and it comes with an aux cable and USB cable, but no wall socket plug. Setup was very easy, it has NFC or you can just add it via the usual Bluetooth settings screen. To set the clock you need to pop it into edit mode (long hold the mode button) and then adjust the time using the up/down touch controls. An alarm can also be set at this stage. It’s an OK alarm, beeping every few seconds and the compact style means this is the ideal travel speaker if you want to not only listen to music but ensure you’ve got a bedside clock and alarm wherever you stay. Speaker quality OK, this is a low cost speaker but has a decent sound to it and the volume will easily fill the room. Perfect little speaker/clock combo for those who want something they can chuck in a bag while on their travels. 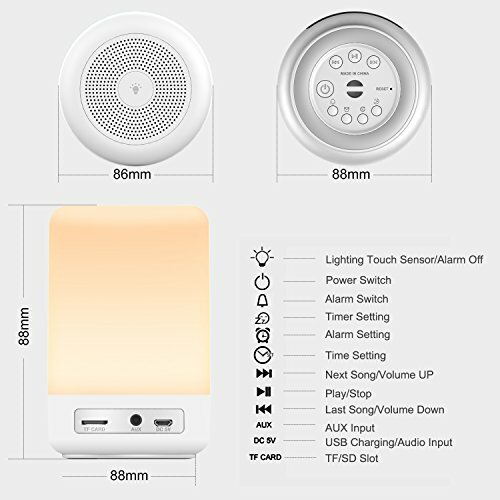 Wireless Bluetooth Speaker--The lamp is equipped with a loud speaker.It supports TF cards and AUX input and can be connected with cellphone or tablet,so you can play any music and listen stories indoor or outdoor. Clock and Alarm--The lamp can display time 24 hours and wake you up with beautiful ring. It builds in a timer,and can turn off the light or speaker automatically. Household and Camping Necessities--It's a good choice for bedroom lighting, bedroom reading, kids night light, outdoor camping lighting and romantic dinners decorating.It's also a good company for doing yoga,listening stories and holding parties. Best Gift for Friends--Modern and multi-functional design makes it the best gift for any special days and suitable for any occasions;Contents-- Yuanguo LED Lamp,Micro USB cable,User Manual, 60-Day Money Back Guarantee and 24-Month Warranty. ★Double Alarm Clock Design - You can set 2 separate wake-up alarms at different times to meet your needs. Perfect for occasions like sending kids to school or going to work on weekdays. ★5.5inch Large Display with Dimmer - The big numbers on the large display are easy to read from a far distance and it has 3 different brightness levels: bright, dim, off. The adjustable dimmer enables you to set the display to a brighter setting in daytime and softer one at night. 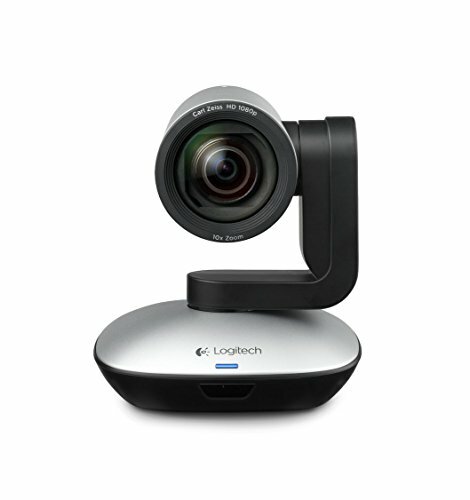 Arc-shaped display allows you to see the time from multi-angle. ★Bluetooth 4.2 Technology - 3.5mm audio output/input, equipped with the advanced technology, Speaker compatible with all Bluetooth compatible devices, with high-power dual-speaker excellent stereo sound and powerful bass, make you enjoy the wonderful music. ★Digital FM Radio - Built-in digital tuning FM radio, allowing you to listen to music, news and weather forecast. The antenna can be extended for better signal reception. ★Multifunction Design - Our Clock Speaker have time display, double alarm clock and FM radio, Also support TF card play. Our Bluetooth speaker totally is your best choice to bring out on the road trip, to play music when you are practicing dancing, or to hit' the music in your party.Perfect gift for your family, friends and lover in Christmas, Birthday, Valentine's Day or Anniversary. ♪【Digital Clock Large Display & FM Radio 】: 7.67inches large LED display without straining eyes ideal for seniors and the elderly with low vision Three brightness levels: Daytime / Dusk/ Night, adjust the brightness by the dimmer button. FM clock radio with strong reception and clear sound. Listen to your favorite channel here and everywhere. 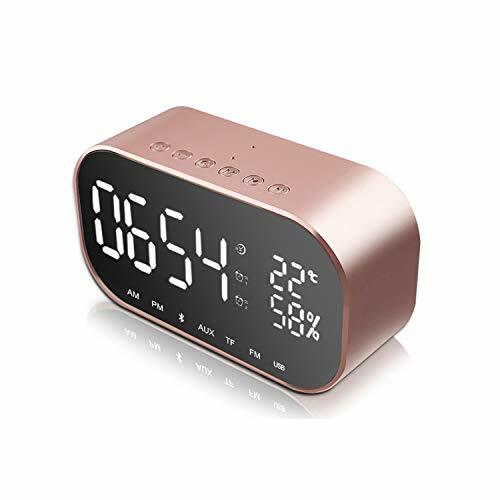 ♪【12 in 1 MULTIFUNCTIONAL Device】: Dual stereo wireless Bluetooth speaker, dual alarm clock, Digital FM radio, Clock, large LED mirror screen with dimmer, night light, TF card play, Aux input and Hands-free call with built-in HD mic. ♪【Four Ways of Audio Input】: Bluetooth 4.2 +EDR, FM radio, built-in TF card slot (64G max not include) and 3.5mm Aux jack, you can use the aux cable to connect with PC. (Aux cable not include) FM Radio: 87-108MHz, you can listen the radio stations, for exmple: BBC Radio, Heart, Capital FM and Smooth etc. ♪【Ultra Compact Portable Body】: Really portable size with high capacity rechargeable 4000 mAh battery for up to 30 hours of playtime at 2/3 volume of playtime on a full charge and 8 hours in maximum volume; superlight and easy to fit in your bag or backpack. Best Gift Choice for Your Family, Friends!